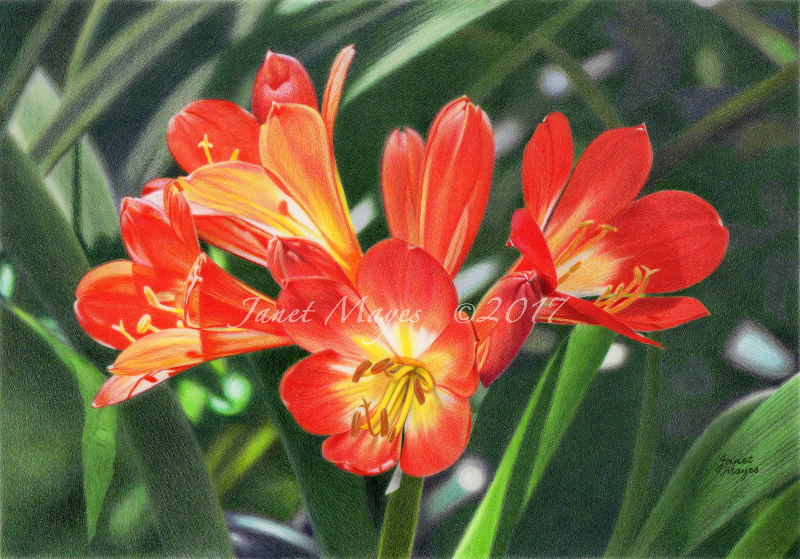 I have just finished a new drawing of some orange clivia flowers from a reference photo I took at a local park. It was completed in a relatively short time for me, having started a couple of months ago. I am still finding blurry backgrounds a challenge, but with lots of patience and careful blending, I think I am slowly getting there. This drawing is one of two pieces that have been accepted into the ‘Petite Pieces’ exhibition at Aspire Gallery in Brisbane. The exhibition opens on 1st February and features smaller works up to 40 cm x 40 cm. This entry was posted in Floral and tagged clivias, colored pencil, coloured pencil, drafting film, drawing, Faber-Castell, Grafix, Polychromos on January 23, 2017 by janetmayes. Wow, those are amazing! I find backgrounds to be the hardest part of a drawing, but yours looks great.